(Back ground) Laparoscopic Nissen fundoplication (LNF) is a choice of surgeries for the treatment of gastroesophageal reflux disease (GERD). To minimize post-surgical dysphagia and achieve a sufficient antireflux efffect, it is ideal that the gastric fundus is lifted straight up toward the cranial side without a twist. However, it is not always easy to determine proper suture points under laparoscopy. We have devised and introduced the procedure of defining suture points in Nissen fundoplication to resolve these issues. (Surgical Technique) After dissecting the hiatus and mobilization of the fundus, the circumference of the esophagus c (cm) is measured at the point of 2 cm cranially from the EGJ over 52 Fr bougie. With defining ƒÎ as the circular constant, the diameter of the esophagus is c/ƒÎ (cm) and the inner diameter of the fundoplication is c/ƒÎ + 1 (cm) by adding a 1 cm of loose part. Then the inner circumference cf becomes ƒÎ (c/ƒÎ +1) = c + ƒÎ (cm). In order to create a 2 cm fundoplication in which the greater curvature of the gastric fundus is moved straightly toward the cranial side without a twist, we locate the points a and b by tracing 3 cm along the greater curvature from the EGJ and then perpendicularly toward the anterior and posterior walls by a half length of the inner circumference of the fundoplication, which is d = (c + ƒÎ)/2 (cm). The points a and b correspond to the top of the left and right suture positions on the fundoplication respectively. Approximately 2 cm of floppy Nissen is constructed by suturing caudally with intervals of about 1 cm. (Patients and methods) A total of 20 patients with GERD and/or hiatal hernia underwent LNF using this procedure from March 2004 to March 2007. The patients consisted of 3 men and 17 women with the mean age of 74.5 years. Two of them were re-do cases. 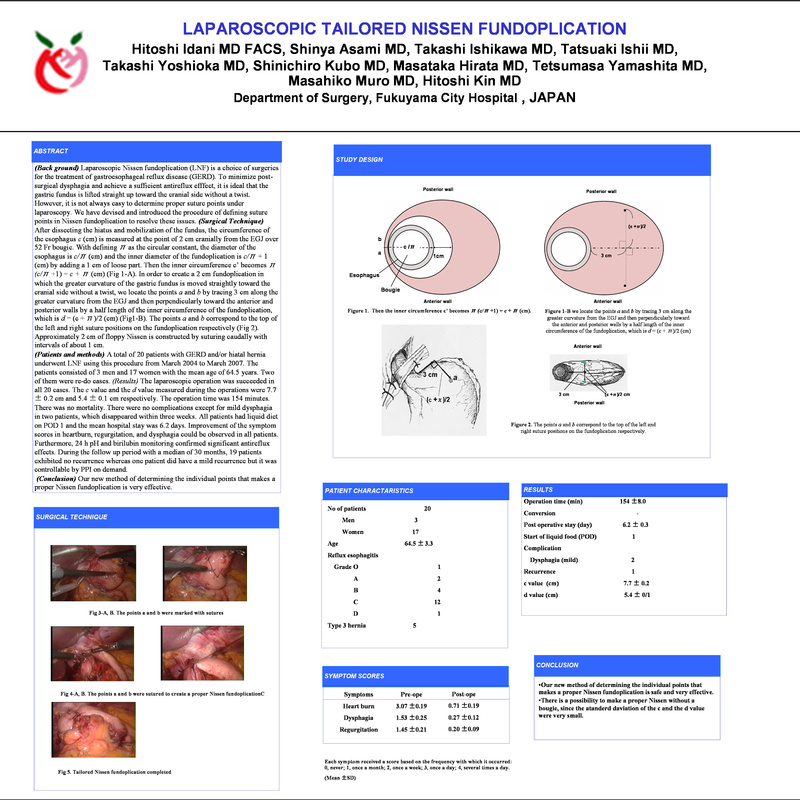 (Results) The laparoscopic operation was succeeded in all 20 cases. The c value and the d value measured during the operations were 7.7 } 0.2 cm and 5.4 } 0.1 cm respectively. The operation time was 128 minutes. There was no mortality. There were no complications except for mild dysphagia in two patients, which disappeared within three weeks. All patients had liquid diet on POD 1 and the mean hospital stay was 7.1 days. Improvement of the symptom scores in heartburn, regurgitation, and dysphagia could be observed in all patients. Furthermore, 24 h pH and birilubin monitoring confirmed significant antireflux effects. During the follow up period with a median of 30 months, 19 patients exhibited no recurrence whereas one patient did have a mild recurrence but it was controllable by PPI on demand. (Conclusion) Our new method of determining the individual points that makes a proper Nissen fundoplication is very effective .